Although we only gather 1 comment from the post, still it is important and we appreciate this fan for having an effort to write her answer and that's why we feature her comments. 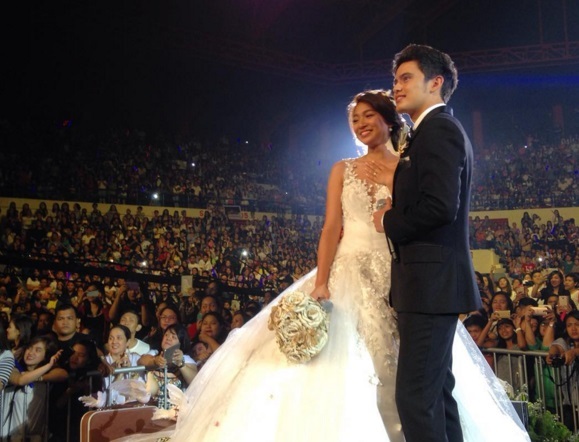 Until now, the real couple still gives thousands of "kilig" emotion to their fans. 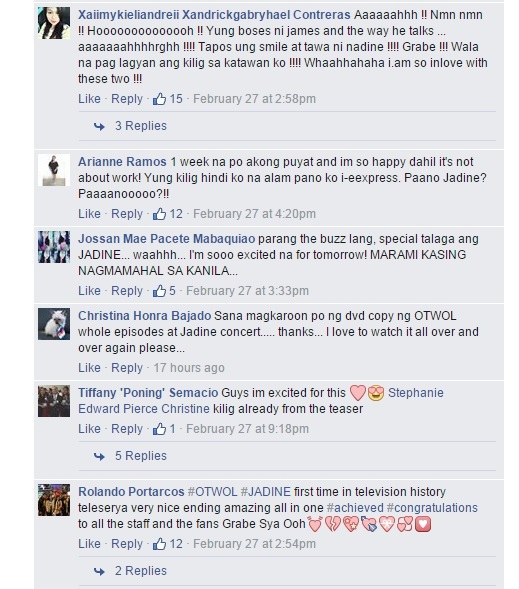 James Reid and Nadine Lustre were exclusively interviewed last February 28, 2016 by Robi Domingo and Grethcen Ho. The replay of the last episode is played before their exclusive interview. Many fans commented that until now they cannot move on to the last part of the episode. 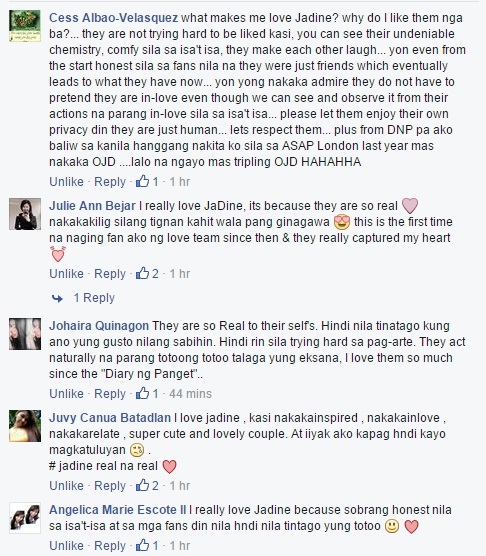 A lot says that JaDine is the only team that gives them a daily does of "kilig". 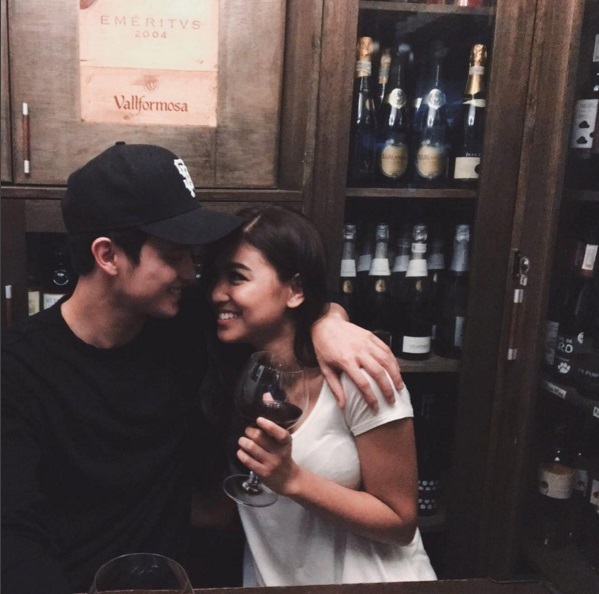 [Blog] - What Makes You Love JaDine? As we all know, OTWOL also known as "On The Wings Of Love" Teleserye has just ended last February 26, 2016. A lot of fans were happy at the same time, a lot of fans were sad too because they will no longer see the couple (James Reid and Nadine Lustre) on teleserye anymore since it ended already.So we posted a question for our JaDine Lovers. 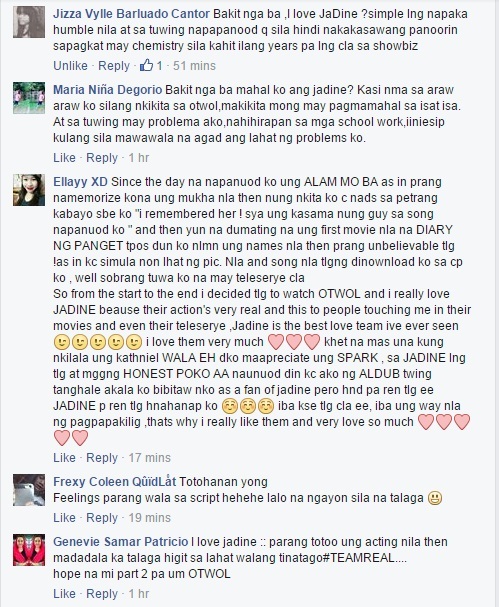 Screenshot from JaDine Lovers Page. 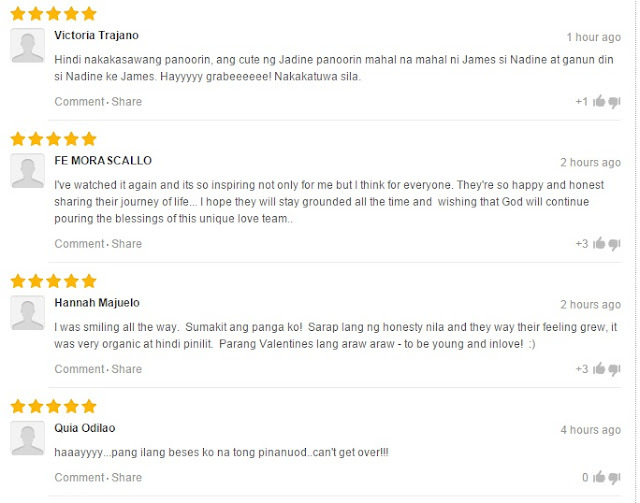 Comments by JaDine Lovers and Fans. So these are just some of the comments from JaDine Lovers. 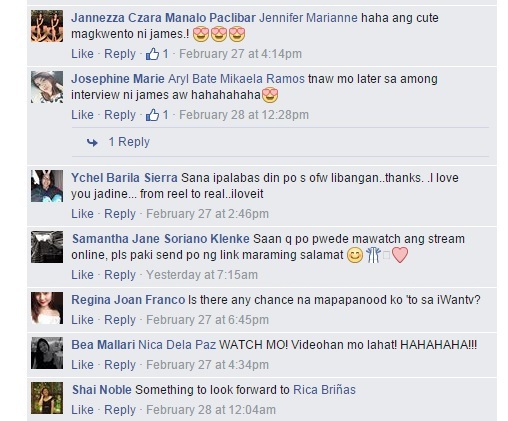 These screenshots taken from the JaDine Lovers Page. 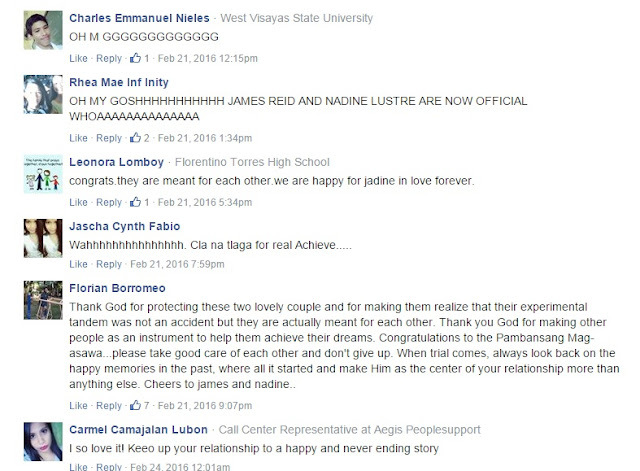 You can see on their comments why and how they started to love JaDine. It is nice to know that many fans admire them so much as well as their messages to JaDine are very touching and inspiring. And here's the last part! For those who haven't seen the last episode of On The Wings Of Love, you can watch it here! And now it's real, a lot fans were so happy to know that the two are officially in a relationship (James Reid and Nadine Lustre). 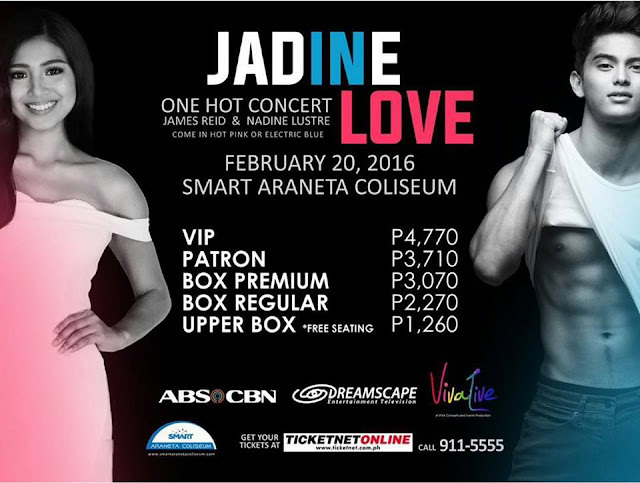 On their concert, Jadine Love held at Coliseum last February 20, 2016, James on the other hand, says "I Love You" to Nadine which means that the two were already official. They thought that it was just scripted but it's for real, you can see on the eyes for Nadine and her reply to James which is a big hug. By that time, the news were circulating and went viral to social media and to the internet. To all JaDine Lovers out there! Here's the Pilot Episode of On The Wings Of Love Series. This will be the start of Leah and Clark's journey. So if you have missed the first episode of the teleserye, watch it now here. This blog is created for Recent Updates of James Reid and Nadine Lustre in Showbusiness, Career, Opportunities and many more! This is also serve as information update for those JaDine Lovers/Fans.